The best way to travel through the open roads is with an RV. Experiencing the world from your RV motor home during autumn is something that you will never forget. As the leaves change, the beautiful scenery offered at many campgrounds and national parks is a site truly worth seeing. The cooler air is great for many activities, such as hiking and mountain biking. When nightfall hits, you can sit by the campfire and share stories, or relax on your RV mattress with a good book. Regardless of what activities you choose while visiting the following top destinations, traveling by RV during the fall months is a great way for you to enjoy the outdoors. Colorado has many camping sites that you should visit at least once, and Chatfield State Park is one. This is one of the different autumn RV destinations that you can enjoy with the family or a group of friends. The destination is known for its beautiful rolling foothills. Fall is the best time to visit due to seeing the leaves change colors, as well as the crisp weather that is great for hiking through the miles of trails located at this park, in addition to other outdoor activities. Autumn is included in peak season at Chatfield State Park. You can stay at one of the 200 campsites in this Colorado area; all of which are within walking distance to the lake. The fall months are the most pleasant times to visit the Grand Canyon National Park. It is drier, compared to other months; however, you should avoid the late summer months and early winter to prevent yourself from dealing with unpredictable weather. The South Rim is the best area to stay in while visiting this popular Colorado RV destination. You have a great view of the Desert View Tower, regardless if you leave your RV or not. There is a small entrance fee; however, you can park on the campgrounds for up to seven days. This includes the North and South Rim. Be sure to go hiking and climbing, or ride a donkey to the bottom of the Grand Canyon while you are vacationing. This wonderful RV camping destination is known for its cross-country skiing and mountain bike trails. Red House is one of the most developed areas within this natural park, and it is paved with miles and miles of trails. 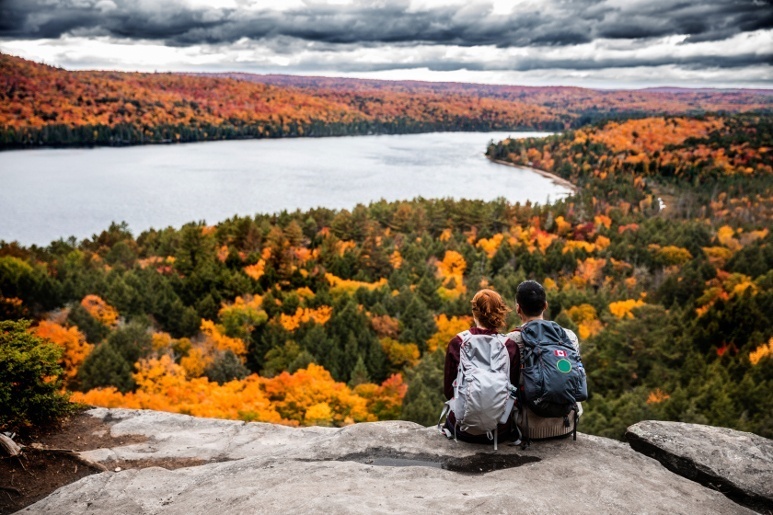 There is a lark festival, Halloween and haunted events, as well as light festivals that you can enjoy at or near this New York national park during the autumn months. This is the perfect northeast destination to camp your RV in during the fall months. While at this New Hampshire destination, you can enjoy boating, swimming, fishing, biking, and much more. The views from the lake are breathtaking during the autumn months, once the leaves begin to fall. This Nebraska campsite has over 22 miles of hiking trails, and other fun, adventurous things to do inside of the park. When traveling during the month of October, you could enjoy the beautiful scenery, as well as a contest or two. Indian Cave has a RV decorating contest each Halloween, and the winners will be posted at the entrance of the park each Sunday. Traveling to these top autumn RV destinations gives you and your family the perfect opportunity to enjoy family time, as well as all that nature has to offer in this wonderful season. The campgrounds and national parks are less crowded during the autumn months, in comparison to the summer time. Another plus is not being surrounded by pesky bugs, such as mosquitoes. So pack up the RV, and enjoy traveling around the country, while getting the chance to experience the great outdoors! Do you usually go on RV trips during autumn? Let us know in the comment section below!